It’s late, maybe midnight. The air extorts discomfort with a chill that shoots straight to the bones and catches on the breath. Blood drips, and dirt clings to at least a half-dozen tired faces. Body fragments form a crust on the floor. Furniture in disarray, casualties of a struggle. But no one in the area seems concerned; they seem downright cavalier. Some are grabbing slices of pizza from a nearby table. 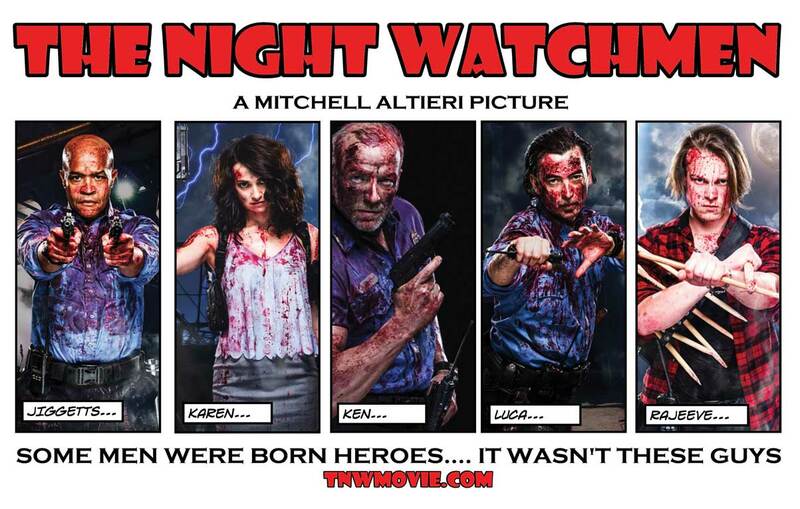 Despite having put in 12 hours of work on the set, the cast and crew of the 2016 film The Night Watchmen are decidedly content. Filming a comedy/horror movie at the former The Capital newspaper headquarters in Annapolis provided a unique experience for the creative minds behind the movie. Director Mitchell Altieri (The Hamiltons, 2006), story creators Ken Arnold (Men in Black III, 2012, and House of Cards, 2014) and Dan DeLuca (The Wire), and co-writer Jamie Nash (Lovely Molly, 2011) brought to life the screenplay that was intentionally written for such an environment. As the tagline suggests, “Some men were born heroes… it wasn’t these guys.” Unless of course, you redefine a hero as someone who makes you laugh until tears roll down your face (which is exactly what this movie does). With support from producers Jeffery Allard (The Texas Chainsaw Massacre, 2003, and The Texas Chainsaw Massacre: The Beginning, 2006), three-time Emmy award winner Demetrea Triantafillides, and executive producers Cheryl Staurulakis (Power of Film award recipient), Leo Staurulakis, and Eduardo Sanchez (The Blair Witch Project, 1999), The Night Watchmen was built on a sturdy foundation. Despite a few challenges, the one hundred-thousand-square-foot warehouse-turned-film-studio offered the ideal backdrop for the movie. Massive open space and minimal insulation necessitated the use of industrial heaters. Years of vacancy allowed dust to form a thick veil over every surface, and converting the space into a movie set required considerable elbow grease. Support from local businesses and individuals was instrumental in completing the filming. When several of the cast and crew developed respiratory infections (Altieri took rests in the dressing room during scene changes to avoid passing out) and an actress sustained a moderate cut on her hand, Staurulakis sent an email to Dr. Mike Freedman of Evolve Medical Clinics, whom she knew as a supporter of the Annapolis screening of her film about the human papilloma virus (HPV), Someone You Love, The HPV Epidemic. “I told him the director wouldn’t leave the set and the actress, still in makeup, looked like she’d been in an accident. He said, ‘no problem,’ and came at 6 p.m., patched her up, and wrote our director a prescription, all as a courtesy,” she says. That’s not to say that their California brethren were any less appreciated. James Remar, of the famed Showtime series Dexter, plays a vampire named Randall and had only five days to film his scenes before jetting off to New Zealand for another production. His contribution provided a prime example of professionalism to the younger actors and staff. In the Los Angeles airport, Remar dropped his laptop before embarking on his trip to Annapolis. The next day, his toe was swollen and black-and-blue. Staurulakis called in another favor, this time to Dr. Denise Varquez-Hoffman. The orthopedic podiatrist worked her schedule so that she could see Remar on a moment’s notice, but the production schedule precluded a same-day appointment. Remar continued working, squeezing his tumescent foot into unforgiving cowboy boots, running around the set, never complaining, and patiently waiting for a free moment to see the doctor. Error: Error validating access token: Session has expired on Saturday, 09-Mar-19 15:57:50 PST. The current time is Friday, 19-Apr-19 11:32:55 PDT.